Price is $3.00 per pound, sold in 2.5 pound bags. Occasionally, our Selenite Sticks are too small, break, or get damaged. There's no point in letting it go to waste! 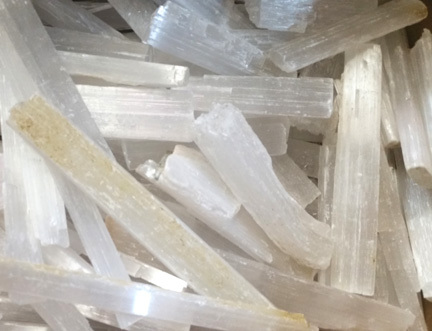 We are selling our pieces of Selenite that are too small to sell individually in a 2.5 pound bag at $3.00 per pound. The sizes range anywhere from 2" to 4" long and .25" to 1" thick.